Yesterday was Easter Sunday and my relatives and I enjoyed a celebratory lunch buffet at Kamay-Kainan at the Trinoma mall. 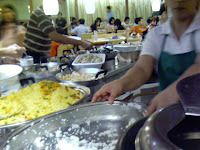 Their buffet consisted of over 60 dishes, free tempura for every table and a salad and dessert bar. There was a huge array of meat-based dishes like bistek, liempo, nilagang baka, sinigang na baboy, kare-kare, dinuguan, mechado, kaldereta and chicken adobo. The seafood-based dishes included hito, tilapia, calamares, and tahong. Other dishes included chopsuey, kuhol and pancit bihon. I found it a bit unusual that out of all the dishes there, my favorite had to be the bird's nest soup. 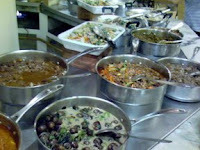 I guess if one would go to a buffet with over 60 dishes, they wouldn't be going back for soup. There was only one kind of soup there, as opposed to the rest of the dishes. 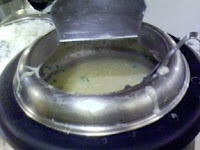 I was so fond of the soup, that I had 2 servings before and after my main meal, and added a bit to my rice serving too. I wonder if there's a place that serves bottomless soup.